You found a suitable casting notice, and you've had your first audition. The audition callback list is up and your name is on it, or you've been called either by your agent or the casting director of a show, to come to a callback. How should you prepare? Start by finding out if they are going to give, send, or if you have to pick up, "sides" for your second audition. Once you have the material you need, it's time to get to rehearsing. You should be keeping an audition log of all the auditions you attend. In this log you will have the day, place, time of audition, who sent you, the names of the auditors, the sides that you were given at the audition, a description of what they said to you(if anything), any direction you were given, a detailed account of exactly what you wore to the audition and any material you performed e.g. monologue(s) or song(s). Using this record of the audition, it should be fairly simple to put your audition callback plan into action. You'll find it especially helpful if the callback is scheduled for a week or more after the first audition. When you audition all the time, it becomes difficult to remember one audition from the other. You'll be keeping good records so the audition callback should go smoothly. Remember, the reason you got the callback is because someone liked what they saw you do at your first audition. Prepare for the callback, but don't stress over it. If they give you the sides, go over them and try to get into the character. If you are working with an acting coach or vocal coach, by all means have them work with you to prepare. If you are not given sides, and you performed a monolgue or two, then go over them and try to elicit the same feeling you had during the audition. Another important point is to gather the exact same outfit that you wore the day of the audition and wear it to the audition callback. You want to give the people who saw you a visual reminder of the first audition and for the new people in the audition room, you want to create the right impression. Obviously, whatever you wore on the first audition must have been right or you wouldn't be auditioning for a second time. 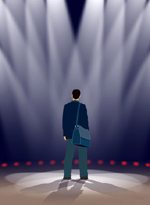 Go prepared into the audition callback with confidence that you will get the part. You now have another opportunity to show them what you can do. There will be less people auditioning at the callbacks and things might go a bit differently. You may be called in to first do your monologue or song, or both. You may be asked to sing and dance. You may be asked to cold read with another or several different actors. Just take it all in stride. Many times the casting director will be trying different combinations of people to see if there is any chemistry in the mix. You may read a scene or two and then be directed to try it another way. Stay open to suggestion and try to do what is asked of you. Many times you are being tested to see if you can take direction. Do the best you can with everything you are asked to do, that's all you can ask of yourself, stay positive. When the audition callback is over, thank everyone for the opportunity and leave the room graciously. Look at each audition experience as another opportunity to perform. Learn from each audition. I know it may seem hard at times but it is possible to take something away from each audition that will help you in the future. Who knows when you will call upon that information, perhaps the next time you get an audition callback. "Sign Up For Our Blog or RSS Feed On Our Home Page"